The trip to Cuba began at a very crowded New Orleans Metro Airport at 4 am. The security line for Terminal D stretched all the way to Terminal C. Every trip has a story and this one is listen to them when they say to arrive at an airport three hours ahead of time for an international trip—you never know when a massive convention is trying to get out all at the same time. The Havana airport was almost as busy, with long, but moving, lines for the customs. Even more prominent were the advertisements for products like Pringles, Samsung and domestic liquors. In spite of President Trump’s recent rollbacks in relations with the Communist nation, the flow of both tourists and capitalism seems to be moving unchecked. It’s appropriate then, that our first stay here is at an exclusive commune an hour west of Havana. The site of a former French coffee plantation, Las Terrazes is named after the farming terraces put into place to grow plants. Coffee is still grown here, but a reforestation project begun in 1968 has been named a UNESCO Biosphere Reserve. 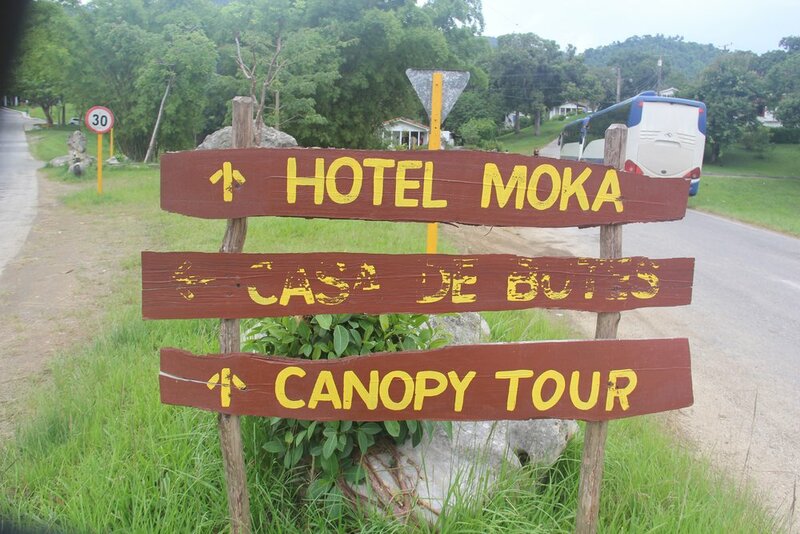 Generations of workers still live on the plantation, but now, Hotel Moka sits there as well, a modern facility bustling with tourists from all over the world who come to gawk at its scenic beauty. It’s held up as a model for what socialism can do and certainly, the command economy has enabled people to live and work the land in a natural fashion. However, Raul Castro’s recent easing of restriction on businesses has seen the growth of small, family-style restaurants, bars and roadside stands where workers can take home more of the money they get from tourists. Here in the heart of this preserve, tourists buy coffee and piña coladas from families that once only knew commune living. The sun is setting as I write from the comfort of a comfortable chair on a terrace of my own, overlooking the water and mountains. Tomorrow, we’ll explore more of the region and move on to our next stop in Vinales.